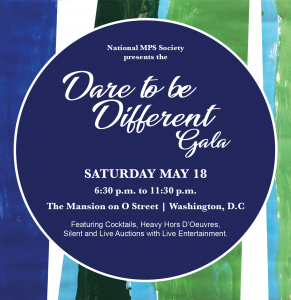 Join us for the National MPS Society’s “Dare to Be Different” Gala – gather for an evening of unique fun and philanthropy at one of Washington, DC’s most intriguing locations. The night will be filled with auctions, entertainment, and one-of-a-kind historical relics you won’t see anywhere else. Join us on Saturday, May 18 at The Mansion on O Street for this event benefiting advanced research and our family support programs. VIP Reception: 6:30 to 7:30 p.m.
Cocktails, Heavy Hors D’oeuvres, Mansion Escapades: 7 to 10 p.m.
Silent Auction Previews, Entertainment: 8 to 9:30 p.m.
Live Auction: 9:30 to 10:15 p.m.
Dessert, Silent Auction Reveals: 10:15 to 11:30 p.m.
To purchase a ticket to the event, please click here. To donate an item to the auction, please click here. To buy an ad in the commemorative program, please click here. To view the invitation to the Gala, please click here.